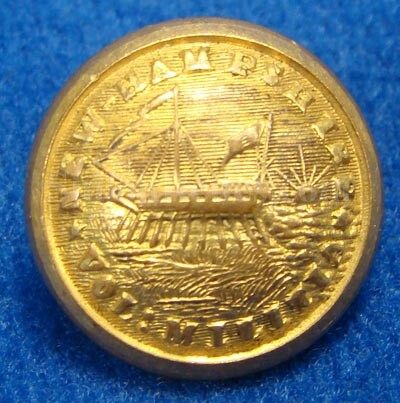 This is an excellent original non-excavated Civil War New Hampshire state seal cuff button. It has fine detail and a nice amount of the gold gilt remaining on the face. 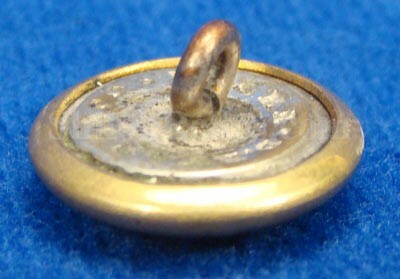 The face of the button has the New Hampshire state seal. The seal shows the New Hampshire ship builders building the frigate "Raliegh” for the Continental United States Navy at Portsmouth. In the background it has the sun rising up over the water. It makes a beautiful scene and this one displays quite well. 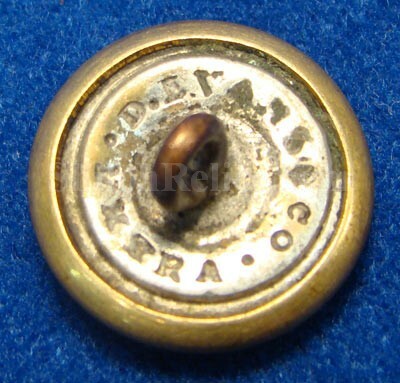 The back and shank are excellent and you can see the maker’s mark of "D. EVANS & CO. EXTRA.” This is the style listed as NH6av in Albert’s book and NH200uncl1 in Tice’s book. This means this version is scarce enough they couldn't find one to examine for the book. This is a fine piece all the way around that will make a solid addition to your collection.